Maurice Hamilton is a well-respected figure in and out of the Formula One paddock, with years of experience following the highs and lows of life in motorsport. He's often appearing on 5Live's F1 coverage and always has something worthwhile to say. He's previously written a chronicle about the Williams team, but here, he takes a closer look at the 2007 season at McLaren, the turbulent battle between Lewis Hamilton and Fernando Alonso. The book dives right in to the start of the story, with Fernando Alonso's decision to leave Renault, the team who secured him two World Championships, and move to McLaren. Signed up alongside him for the 2007 season, a young rookie by the name of Lewis Hamilton, a particular favourite of team boss Ron Dennis, but not considered a huge threat to the defending champ. For those of us that watched the season, we already know how this story ends, but Hamilton uses his journalistic skills to delve behind the headlines we might have already seen and find out what made those involved make some of the decisions they did. It's a remarkably unbiased piece of writing, considering the high emotions and questionable actions detailed along the way, and there are no significant conclusions drawn at the end. That's by no means a bad thing, the book simply gives the reader the tools to make their own judgement. More important, Alonso was quickly becoming aware that Hamilton would be more than capable of using his equal opportunity, possibly at the Spaniard's expense. Dennis's chat appeared not to have provided the necessary reassurance, particularly when Alonso later told Spanish journalists that he felt his boss had been patronizing when explaining their conversation to the media. There's a liberal use of direct quotes throughout the story. It gives colour and realism to the tales being told, but sometimes does get a little wearing. I would rather hear what the author has to say, and what he makes of it, than read the public domain quotes from those involved. They do help the story move along, though, so the quotes do have their place. Although the majority of the book is taken up with the power struggles within the McLaren team, there are also historical interjections sprinkled throughout the book. After finishing up a meaningful chapter, Hamilton jumps back to 1986, to see how the action compares with the fraught relationship between Alain Prost and Ayrton Senna. The history element is appropriate, although I do think some of the connections are tenuous. The stories illustrate that nothing really changes in Formula One, and that a real rivalry has a lot more depth to it than just battling for track position. Comparing the two seems the right thing to do, but I get the feeling Hamilton's trying a bit too hard to make them fit together. Unhappy with his lot, Piquet had begun to murmur to the Brazilian press that the Williams team, being British, appeared to be favouring Mansell, a complaint that would have a familiar resonance twenty-one years later. There may have been in-house rivalry and distrust in 1986 but that would have nothing on developments within McLaren that were about to tear both the team and F1 apart in 2007. 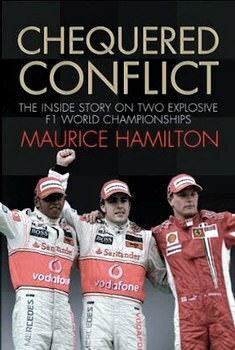 With two different seasons to talk about, in two completely different decades, Hamilton also finds himself covering the McLaren/Ferrari espionage saga in great depth. There's plenty to get your teeth into in the book, and assuming you're as much a fan of the off-track F1 action as you are the on-track stuff, then you'll find something of interest in here. Well-written, easily readable, with plenty of quotes and sources to add colour and depth to the story being told. This is either aimed at new fans who might want to catch up on some of the recent controversies they've missed, or the longer-term fans who want to relive what was a tense season, filled with emotional fireworks. Previous post Tweets of the Week - Who runs the world?